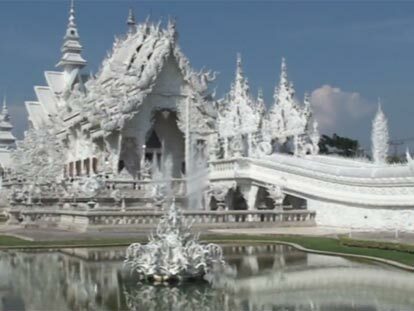 One of Thailand's northern-most cities, Chiang Rai is famous for the magnificant White Temple, its proximity to the Golden Triangle, and the friendliness of its people. Enjoy exploring the region in your great value Chaing Rai car rental! Chiang Rai International Airport (CIE) has yet to handle international flights, but is a popular airport nonetheless. This airport services the area of Mueang Chiang Rai, which is located in the northernmost are of Changwat Thailand, very near the borders of both Laos and Myanmar. This makes Chiang Rai Airport the perfect place to pick up a car for travels to any of these areas. CarHirePhuket.com’s Chiang Rai pick-up point offers a wide selection of cars to meet all the terrains found in the area, to include off-road riding to easy highway driving, and all of our vehicles come equipped with air conditioning — and all at the very best rates around. Find the best hire deals from top Thai rental companies — cheap car rental at Chiang Rai Airport is just a search away! For religious students and lovers of statues, the temple at Wat Pjra Kaeo is a must stop, as this is where the Emerald Buddha was unearthed but now displayed on Royal Palace grounds in Bangkok. It is said that a bolt of lighting hit the temple’s stupa, cracking open and revealing the Emerald Buddha inside. This temple also has an excellent and air-conditioned museum open to the public. Perhaps one of Thailand’s most awe-inspiring temples, Wat Rong Khun “The White Temple” is a contemporary Buddhist temple constructed in the 1990’s. Representing the path from rebirth to the Abode of Buddha, the magnificent bridge is the scene used by many wedding parties for their photo shoots. Certainly well worth the short drive from Chaing Rai City. For another interesting museum, visit the Hilltribe Museum and Education Center in the middle of town, which exhibits the housing, tools, utensils, and equipment used by the hill tribes over the ages. There is also a branch Bangkok’s famous Cabbages and Condoms Restaurant to feed the hungry during your visit to the museum. For those that like to get out of town and hike a bit, there is the Namtok Khun Kon Forest Park, which is located off Highway 1 about 30 kilometers from Chiang Rai center. From there you can find the Kun Kon, a waterfall some 70 meters in height. There is also the Gate of Siam on the nearby border with Laos, where you can photographic vistas overlooking the mighty Mekong River. In addition to these great parks, there is the Phucheefah, which offers some of the greatest sunset views in the area. Check out the Golden Triangle tourist guide on 1StopThailand.com for more ideas. Chiang Rai International Airport (CEI) is the portal to the city of Chiang Rai (population 62,000) and the northern most areas of Thailand (the Golden Triangle). The Mae Kok River flows through the city and offers pleasant picnic spots along its banks, and represents the slow moving lifestyle of the area. 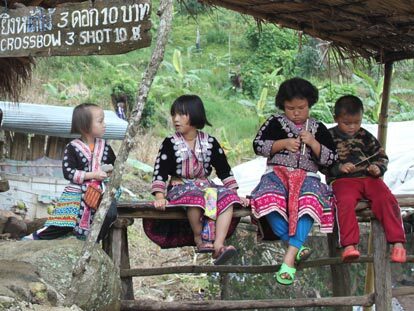 While a bit off the international tourist track, Chiang Rai offers excursions into the hill-tribe areas of Thailand that can’t be found elsewhere. The area also abounds in natural beauty (many hot springs and waterfalls), as well as world-class Golf resorts, such as the one in Santiburi, which is just a short drive east of town, as is Waterford Valley, just a bit further north of the city.